This award-winning book — one of several recommended by book chains to help children understand principles of conflict resolution — resulted from a wonderful collaboration between Dan and artist/illustrator Taylor Bruce. It tells the story of a young boy who learns to face his fears (and a neighborhood bully) not by fighting or running away, but by applying a wonderful secret. Aided by a young girl and an old man named Socrates, Danny learns what it means to live like a peaceful warrior. 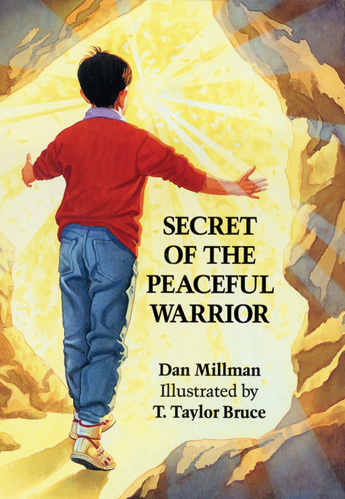 One day, my publisher, Linda Kramer, asked, “Dan, do you think you could write a book for children that conveys some of the lessons and inspiration in Way of the Peaceful Warrior?” I thought about it. This book, along with my other children’s book, was my response. I read the manuscript to children from four to ten years old, to classes of kids who gave me great feedback and suggestions. I had young children of my own who also helped. Neither preachy nor didactic, it is nonetheless a teaching tale, conveying higher values to children even as they are drawn into a real-world adventure. If you have children or know any, give them this gift.